You have discovered the webpages of "Modern Gypsies" David & JoEllen Laurita and Toby the cat. We are fulltime RVers traveling around this great country in our Ford dually pickup (The Mighty 350) and 5th wheel camper going where the winds may blow us. 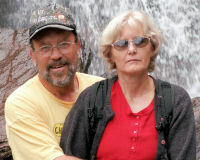 We are now in the third year of the Great MisAdventure and enjoy the freedom this fulltime RV lifestyle promotes. We spend time sightseeing, walking, gold prospecting, crafting, reading, and web building, as well as soaking in the local culture of wherever we visit. David & JoEllen married in 1976 with a small ceremony in Northglenn, Colorado. We are both Colorado Natives, born and raised in the Colorful State. We have two grown children still living in Colorado, Angela & Marcus. David is turning 55 this year and looking forward to his senior discounts. JoEllen is somewhat younger and still holds the attention of her mate. David started working with Mountain States Telephone & Telegraph Company in 1973. He moved to Vail, Colorado in 1975 as a combinationman and installed home phones, quickly moving up the technician ladder into more complicated telephone work. After marriage to JoEllen, we raised our two children living in the towns of Gypsum and Eagle. David joined the Gypsum Volunteer Fire Department in 1981 and became Assistant Chief for several years. David was also a Councilman for the Town of Gypsum during these years. In 1994, we built our dream home in Eagle, Colorado and lived there until David was offered a promotion to management in Denver. David was offered early retirement in 2001 from Avaya, and then went to Casino Dealers School and became a Blackjack Dealer at a small casino in Black Hawk, Colorado for 13 months. This is where the moniker DealinDavid, which he uses on internet forums, came from. David continued to work casinos in the mountains until April, 2005 as a bartender. JoEllen mostly did her work as Mother and Home Manager. She worked at Summit Lumber in Eagle for a time while we were building our home, and continued to work there until we moved to Denver. She worked for a Hobby Lobby craft store in Denver where she was bitten by the crafting bug. She started making soft sculptured dolls and soon BeFRuiTFuLKReaTioNS.com was born. She now spends some of her time crafting in the tiny confines of our 5th wheel home. 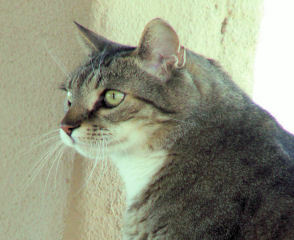 Toby came to us as a tiny little kitten in 1998. It seems that a stray cat had a litter of kittens at the lumber yard where JoEllen was working, the rest is history. He became our daughter's cat until she moved away to college and was left in the care of JoEllen. Now the two of them are inseparable. He hated traveling when we started the MisAdventure, but now has settled down and tolerates moving. We purchased some property in the Wet Mountains of Colorado, midway between Westcliffe and Cañon City for our summer home. This piece of Colorado Heaven is perfect for our fulltime RV lifestyle. No power, quite, and ours! There is plenty of room at The MisAdventure Ranch if you would care to visit. The water well is in and there is plenty of room for your campsite. Just email David for directions. We had dreamed for years of following our parents and go live on the road. Our Parents lived and traveled in large Class A motorhomes for years, we had been awaiting our turn. With both of our kids out of the large house we had in Littleton, we decided to sell out and become gypsies. We closed on the sale of our home July 1, 2005, and started our MisAdventures July 15, 2005 after finding and purchasing our Mighty 350 and 5th wheel camper. Our camping experiences prior to this were mainly in tents and pickup campers. Having driven many large firetrucks David had never really towed a trailer before so the first MisAdventure to Missouri became a learning experience. Just what does that brake thingy under the dash do? Why does it feel like a boat anchor is behind me? So that's what heavy crosswinds feel like. Why does the fuel gauge on the Mighty 350 move faster than the miles of highway? David now knows how to work the brake controller, is used to having the boat anchor behind the truck, and still wonders about the fuel gauge and the diesel that seems to disappear when towing. David is the webmaster of this website spending time to design, build and load the information to the internet. Most of the writing on the MisAdventure pages comes from him. The writing for the BeFRuiTFuLKReaTioNS.com website is done by JoEllen and uploaded by David. He has now branched out designing webpages for The Quartzsite Metal Detecting Club and taking on other webdesign projects. Please consider him for your webpage needs. We use AT&T wireless for phones and are pleased with the coverage of this provider, and highly recommend AT&T for your cell phone needs. Although at times are not within range of a tower, we try to check messages often when we are camped in areas of no cell coverage, please have patience. We do have a Wilson Cellular Amplifier, and recommend this piece of equipment when camped in areas of weak coverage. We are now in the space age with HughesNet satellite internet service and will be able to respond to email wherever we might be. Our internet setup includes a tripod with the dish mounted in a portable configuration. This setup is easy to store, and so far, no problem to align once moved. The service is better than the wireless air card we were using, and is available wherever we park. We do miss the convenience of having internet while traveling down the highway, but with the MisAdventure Ranch out of cell range, HughesNet was a solid choice for us. Getting your mail on the road is a problem we have fixed by using My Home Address, a mail forwarding service located in Emery, South Dakota. Our legal address is now in SD, as well as driver's license and vehicle registration, and we vote by absentee ballot from Hanson County. Service has been excellent, We recommend Ron and his team if you are looking for a solution to your mailing problems.